I have been using The Next Step in Guided Reading as basically my bible since it was published. The information included is amazing, but refer back to my previous comment - TIME. I never have time to reread it every year like I want to. That means, the book ends up on my shelf, unused and I make things up on a spur of the moment on my feet kind of teaching. I am always ok with that, but I really wanted to be more organized when it came to my guided reading time. I have been working with words, doing t charts and doing guided writing for years, but it is always fly by the seat of my pants. I wanted to change that. I figured that there are many of you that feel the same way. I need more time. I want to utilize this book, but I don't have the time to dig through the book for the information that I need. I have gone through this book so many times, I've lost count. I want to bring to you Guided Reading Cliff Notes! My cliff notes range from our non-readers at level A or 1 (depending on if you do DRA or GRL) and go all the way to J/18. This covers the entire book. I have gone through all the boring reading, and picked out what you need to implement guided reading in your classroom. I have shared all of the letters that you need to do word work ladders. I have given the words you need for your sound boxes and t charts. All you need are your guided reading books, magnetic letters and if you want them, word or letter picture sorts and kiddos! This pack even tells you what you will focus on during guided writing time!!! If you feel that this would be a good purchase for you, please click on the pictures to go to my TPT store. If you are looking for guided reading communication letters to share with parents, you can click the picture to see them in my store, or you can click here to read the post about them. My bundle includes the cliff notes, the guided reading letters and my sticky note running records pack to collect data! I will be giving away my bundle to one lucky winner! All you need to do is pin the picture above from this post, and leave a comment with your pinterest name, along with the pinned image link and comment if you use GRL or DRA. 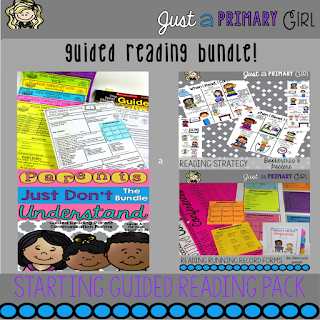 Let me know if there is anything else that I can add to my bundle that would make your guided reading time easier. My Pinterest name is Andrea G. We use GRL. I will be new to first grade next year (from second) and this pack would be so helpful! I love it! My Pinterest username is mapaga. It is in my "primary balanced lit" board. We use GRL. Ooh, what a great product! 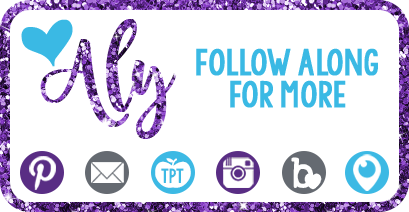 My pinterest name is Jodi vanderLoos and here's the link! We use actually use PM Benchmark Levels, but DRA would probably be closest! Hi. I am a third grade teacher. I just returned to the classroom after being on a 4.5 year break taking care of my own kids. I taught 5th grade for 12 years. I am finding myself stuck on how to help my low kids who reading at a 1st and 2nd grade level. I saw your instagram story and really liked the word work of your guided reading. I purchased the package today from teachers pay teachers, reviewed it and now I feel a little lost with the whole thing. I know you are getting reading to go on leave but is there any way you could film yourself with students going through each step of the lesson plan you provided. I am finding myself needing direction.